We’ve been working hard on a way to give you more insight into our drop rates, and to give you more information so that you can make educated decisions when purchasing items like Crystals. Many of you are aware that there have been some new guidelines introduced for games like ours to encourage us to be more transparent with our players. This is something that we have been discussing for some time now, as many of you have asked for this information in the past. We took our time to ensure that we are displaying the information within the game in the appropriate and most effective manner. We’re happy to let you all know that this information will be coming your way when we launch our version 5.2 Update! When you update to v5.2 and visit any in game store where you can purchase a crystal with in game currency (Energon, Shards, etc. ), you will find an info icon. When you tap this Icon, you’ll see a pop-up that includes the drop rates for the items within the crystal, displayed as a percentage chance. Note, you will not be able to see the drop rates on free Crystals, such as the Daily Crystal, Alliance Crystal, or 4-Hour Crystal. With so many different Crystals available in the game, we worked closely with Apple to ensure that we could display the drop rates for the most needed and relevant Crystals without overloading our development process. These rates you see are set in the back-end and directly display the drop rates of the crystal. This means that there is no room for human error and you are getting the most accurate information. We strongly believe in keeping Transformers: Forged to Fight fair for all of our players, and do not, nor have we ever, create specific drop rates for individuals. - If you have a coin, the likelihood of tossing this coin and getting heads vs. tails is 50%. Each time that you toss the coin is independent of the previous coin toss and the likelihood of getting heads vs. tails doesn’t change because you tried again. If you toss this coin 10 times, it is possible that it may turn up heads every time, just once, twice, three times etc. 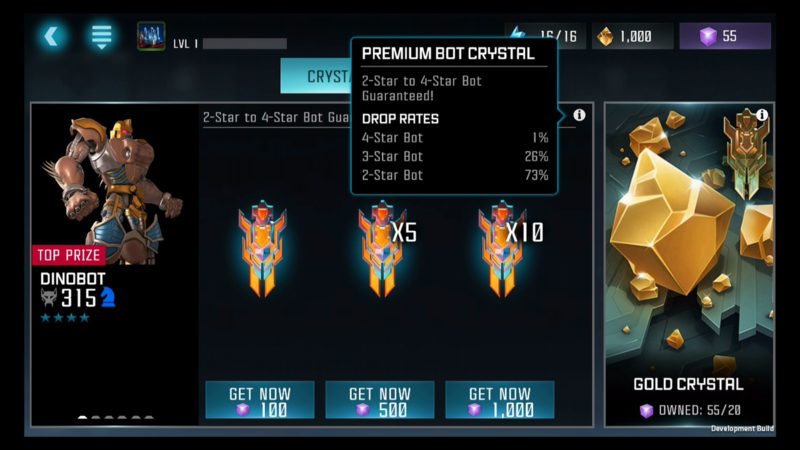 - In relation to the game, if you buy a Premium Bot Crystal, and the drop rate for a 3-Star Bot is 26%, this doesn’t mean that if you buy 4 Premium Bot Crystals you’re guaranteed to receive a 3-Star Bot. This means that you have a 26% chance to get a 3-Star Bot each time you open that Crystal. 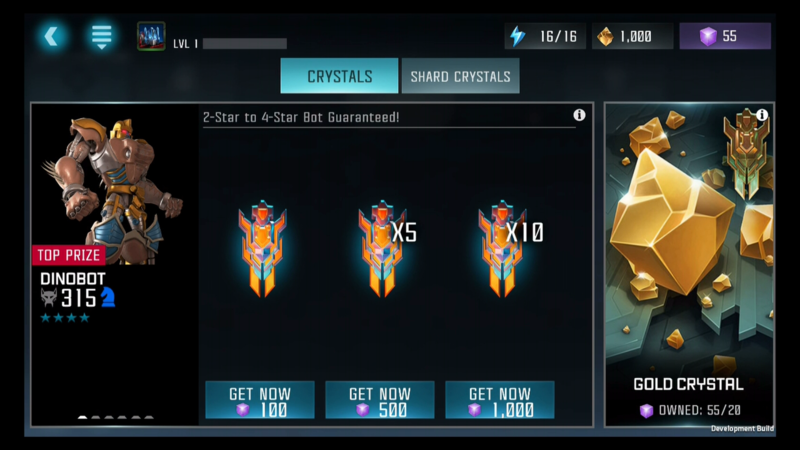 If you purchase one Premium Bot Crystal, you could receive a 3-Star Bot, or you could purchase multiple Premium Bot Crystals and not receive a 3-Star Bot. Thank you all for your patience and understanding as we worked to bring you all this information. Sometimes, things will take some time for us to investigate, research, respond to, and be able to take action on. In this instance, it took us a little while to update our in-game menus to support this new level of information. We're happy to bring it to you all now! Our mission is to continue to give you updates on Transformers: Forged to Fight, and continue to push the needle on how transparent we can be, and how much information that we can share with you all. We're aiming to have version 5.2 out to you all on March 7th, barring any delays.